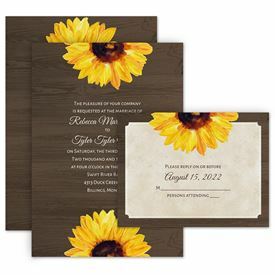 Country wedding invitations have a certain charm and elegance – perfect for introducing your wedding celebration. 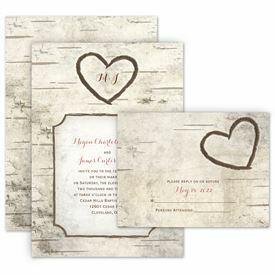 There are so many different styles of country but we've got the country wedding invitations to fit your specific style, whether it's classic, modern or rustic. 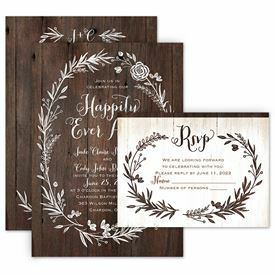 Canning jars, wood grain backgrounds, burlap and lace are all lovely motifs you will find on the many country wedding invitations we offer. Are you more Western than country? We've got those, too! 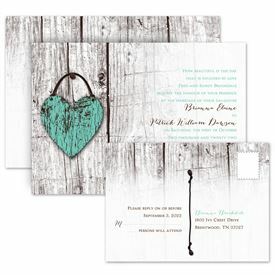 Shop our collection of Western wedding invitations and find the design that's perfect for your celebration. Our country wedding ideas don't stop at the wedding invitations. Country designs are available on many of our products, from wedding invitations to wedding favors. Favor bags, favor boxes and favor seals are all available with country-inspired designs. Start personalizing the item to see what designs are available. We highly recommend looking into wedding napkins, too. As far as country wedding ideas go, wedding napkins are one of the best you can invest in. They're cheap, attractive and practical.